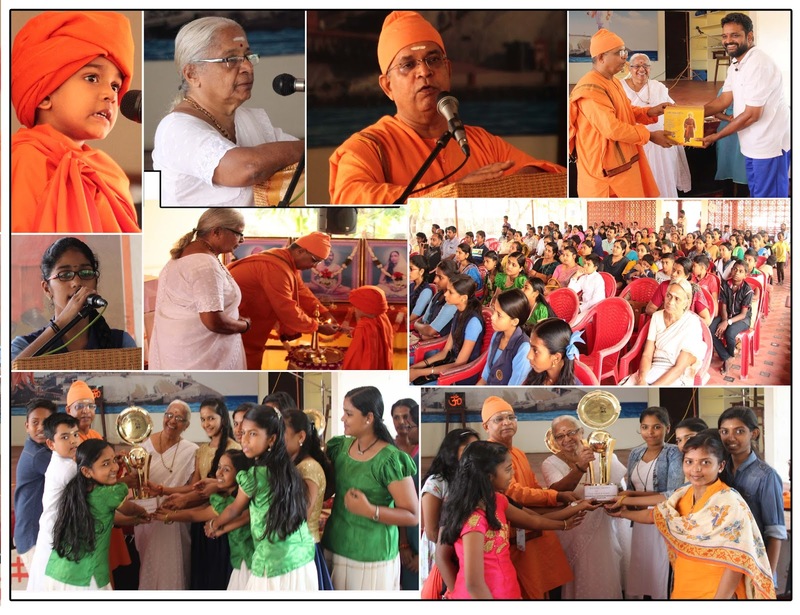 A pradakshina around the campus of Anandadham was arranged on the 155th birth anniversary of Swamiji. Sandeepani Sishuvihar children, their parents, teachers and the inmates of Anandadham took part. This was followed by speeches on Swamiji by the tiny tots, a short talk by Mananeeya Didi and pusparchana. Prasada distribution followed after the children's programme. On the same day, powerpoint presentation of Samartha Bharathb Parva was done in two schools MES Asmabi School and Sri Sai Vidya Bhavan in P.Vemballur. 100 students of class VIII attended. Yoga Certificate Course students conducted the ppt programme. To test their grasping capacities, students were asked questions based on the ppt. Those who answered confidently received Swamiji's books as prizes. Patriotic and folk group song competitions were conducted in Anandadham, on 17th and 18th January. 14 schools and a total of 80 students participated. Samuhika Surya Namaskar competition was held in the same campus on 19th January. The students demonstrated 6 rounds of Surya Namaskar in groups of 12 each. Boys and girls groups were separate. 6 schools, totaling 142 students participated. The creative skills of each group were beautifully projected. Each school performed the same steps in different formations, It was a real treat to the eyes. The 155th birth anniversary was celebrated at Anandadham, on 21st January, Sunday. 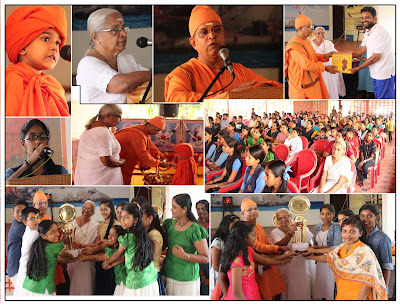 Srimad Swami Veerabhadranandaji Maharaj, head of the Haripad Ramakrishna Math center, was the Chief Guest. 200 people attended. The programme started with a song on Swamiji by Kum. Sree Lakshmi, who conducts Samskarvarga on every Sunday at Anandadham. Mananeeya Didi welcomed the Chief Guest. Swami Veerabhadranandaji spoke on the need of focused mind not only for the students but for all in order to create an ideal society, free from hypocrisy and filled with love for themselves, others around, their society, and country. The winners of Patriotic and Folk songs, both juniors and seniors presented their songs on the stage.There was a short speech delivered byMaster Ananthasree dressed as Swamiji, UKG student of Sandeepani Sishuvihar. Prizes were given away by the Chief Guest. The Rolling Trophy for the best Patriotic Group Song went to Amrita Vidyalayam, Kodungallur whereas the Trophy for Folk song went to Shantiniketan International School, Kodungallur, for the second time. A special prize was given to Sri Udayan, Kendra Karyakarta for the essay he wrote on Swami Vivekananda and his love for India. There was a sumptuous meal sponsored by Sri Murli and his wife Rema, of Irinjalakuda, a very close well-wisher, were the sponsorers of the meals.